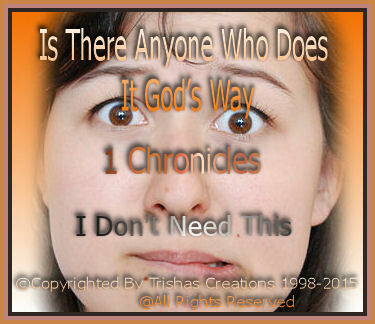 "Is There Anyone Who Does It God’s Way"
Welcome to "Is There Anyone Who Does It God’s Way "
There are several people in my family and I am sure there are all over the world, where they just think their way is better and best for them, and they are going to do it their way or no way at all, not even God’s way. Have you been around, that is like this. Hmmmmm, I guess this is the excuse they are living by because their lives are no better actually it’s become worse. People, need to understand & acknowledge and be reminded, WE ARE GOD’S, we are to be in God. Do you remember, while going through all those tests & trials and all you could do was wish you knew then what you know now on what you are experiencing in the present? We all live by our words, our attitudes, they all come together and it goes “boom” when they meet. We should worry about what, how, we act. God is watching, He is also hearing everything word that comes from your mouth, other’s as well. 1 Chronicles 1:27 tells you more, it talks about Abraham, God in Genesis called Abraham to take up and leave His family, home, friends all that he knew, because God wanted him to go so He could show him the place He wanted him to go. Abraham was obedient and God made some serious promises to Abraham, ones which involved, leadership, blessings and wealth, fame, descendants and much more. God and Abraham entered into a covenant Genesis 17:5. One thing is Abraham, surely believed was in God he trusted Him in everything. Abraham followed what his wife Sara said, and took her maid as a second wife, they didn’t wait on God to bless them with their first child. Sara, got tired of waiting on God, they took matters into their own hands. The child wads called “Ishmael” he wasn’t the promised child, which God promised. What they did, was not in Gods plan for them. God named Abram – Abraham, because “Abraham – means Father of a Multitude” He changed his name because He wanted Abraham to be the father of many nations. If, you can see by reading this, you can visualize what happened in your mind. God is the author of all things, even what we do and what happens in our lives. If, we don’t go by His plan He planned in our lives, we do live by our own words and actions, the choices we make determines our future. If, we choose not to do things God’s way and you choose your own way, then you will go through many heartaches, frustration, anger issues, some will go through life, death circumstances, stop and think by not doing Gods way and His will, and deciding to do your own thing, can be some really horrific results. Your life can become very painful and stressed out, if we choose to live Gods' way his will we can be assured that as long as we allow Him into our life, we have a much better chance to see His blessings come into our life, than choosing to live our life by our own wills and ways. Times of confusion, bitterness and always being in need, we really need to put God first in our lives, and not just by speaking the words, but whole – heartedly. Doing, our own way, never works trust me, I wish I could’ve and would’ve known all this before I made the bad choices I made throughout my life. I wish I could get people to stop and realize this and come to grips with their lives, because their way isn’t working and it won’t until they allow God in their lives. Let God in, Let Him control your life, and be the center of it…. He does have a good plan for you, you just have to want to , want it bad enough!